Hi, I’m James. Lately, I had received a phone call from my banker where he told me that the bank has just launched a cash advance offer. I’m entitled to receive cash upfront of, let’s say RM 10,000, at 0% interest rate. If I’m up for it, I’ll pay a 3.88% one-time cash advance fee after 1 month of receiving the cash and make repayments of the RM 10,000 which would be divided equally over 6 months. First, let’s establish that the offer is only worthwhile if your return from utilizing the cash received is greater than its cost. In a glance, you may opine that the offer to be ‘attractive’ as it is marketed with terms such as ‘0% interest rate’ and ‘3.88% one-time cash advance fees only’. If that is you, please hold onto your horses. Here, I’ll share how anyone can safely estimate the true cost of taking up such cash advance offers before deciding on it. This involves the usage of the Internal Rate of Return (IRR) formula. You intend to place RM 10,000 into a Fixed Deposit (FD) account, where it has a 3.00% interest rate a year. You intend to collect its interest on a yearly basis and close the FD account after the third year. So, what is the IRR of the FD account? 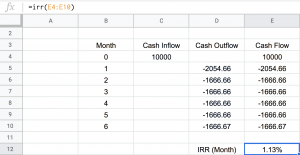 At the box ‘E8’ – Blue-Coloured Box at Bottom Right Corner, you may insert the IRR calculator function: ‘IRR(E3:E6)’, which represents the total cash flows from your placement in a FD account for 3 years. Needless to say, the answer is ‘3.00% per annum’. What About the Cash Advance Offer Above? You may apply the same two steps illustrated above to calculate the IRR of cash advance offers on a per annum basis. The cash advance fee of 3.88% or RM 388 is to paid for the first month of your installment for repaying your cash advance. The monthly installment is RM 1,666.66 which is RM 10,000 divided by a total of 6 months. By using the IRR calculator, you’ll find the IRR is 1.13% per month for taking up the cash advance offer. This is simple. Just multiply the IRR of 1.13% a month with 12 months. Thus, its IRR on a per annum basis is 13.55%. The true cost for you is equivalent to 13.55% per annum if you decide to obtain the cash advance offer, not exactly ‘only 3.88%’ that was initially marketed. In other words, if you cannot generate more than 13.55% a year from using the cash disbursed to you, then, the offer is not worthwhile. 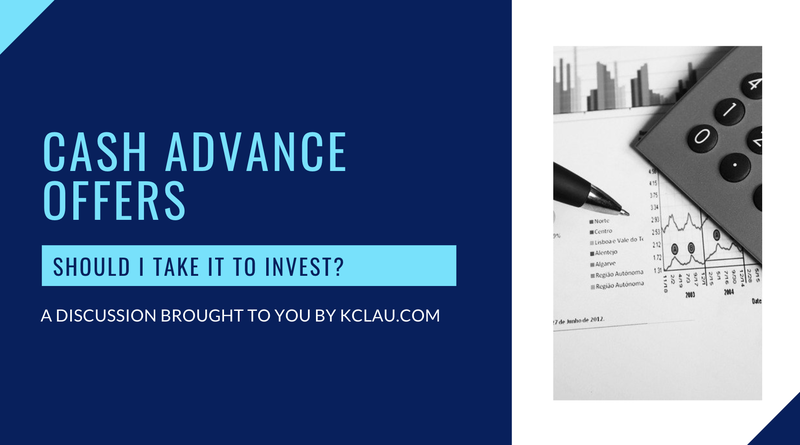 Question 1: Should I Take the Cash Advance Offer to Invest in Stocks? In most cases, investors may not take up the offer as they are investing over the long-term. It is very unlikely to find stocks which pay well above 10% per year in the stock market. Also, from the viewpoint of a growth investor, it is not wise to incur ‘short-term cost of capital’ in pursuit of ‘long-term capital gains’. I believe, there is no such a thing as investing for short-term capital gains. Many who believe that they can ‘do it’ are gamblers and speculators who do not have any trading skills to make it happen. So, if you do not have the necessary sets of skills to survive in the stock market, please invest, instead in proper investment education first before participating in the stock market. Question 2: Who are the ‘Better Candidates’ to Take Up the Offer? I believe, the cash advance offers are more suitable for business people such as small-size traders, hawkers, and owners of mid-size enterprises. For instance, a trader finds a certain product where its cost is RM 1 per unit and is marketable for RM 2 per unit. His profit margin is 50%. He intends to place an order for 10,000 units of that product immediately, but, he is lacking in cash. Thus, the trader signs up for the cash advance offer. He receives RM 10,000 and uses it to buy 10,000 units of that product for RM 1 each. Let’s say, he is able to sell all of them for RM 2 each. He will collect RM 20,000 and hence, will profit a net of RM 9,612 from the cash advance offer. Although the cost is higher than a typical business loan, but, the process to get cash advance offers are quicker as they involve less paperwork. As such, I think that such offers are popular among business people. Question 3: Should I Pay Off My ‘Cash Advance’ in Advance? This is because the bank has already collected the 3.88% (their earnings) in the first month of the 6-month installment. There is no difference to you, if you opt to settle it immediately or to continue with its installment till the finale of the 6 months. Cash advance is a good financing tool if you are able to generate better returns from utilising the cash disbursed than its true cost. Its true cost is calculated by using the IRR formula and not to taken blatantly from the marketing piece from their bankers. « Previous Post I Lost RM 20+k in Unit Trust. What Should I do? Next Post » Should I Take a 5-Year Car Loan or a 9-Year Car Loan? 2 replies to "Should I take Cash Advance for Investments?" Great explanation, even though i understand the concept but you made it so simple and very clear with the calculation of IRR which makes everything so easy to calculate instead of having it as a concept. Another question that I have been Looking for answer: generally it is advisable to get a car loan not more than 5 years but I can’t explain in a good manner as to why don’t take more than 5 years loan. As I am a number person, I can only grasp the idea better when I am presented with calculation.